Tuesday 2nd October saw the final session of the “Introduction to Golf” series run by Fields in Trust (formerly the National Playing Fields Association) supported by the Rotary Club of Kilmarnock and East Ayrshire Education Authority. The coaching is aimed at young secondary school pupils from the Kilmarnock area and this year the final event comprised pupils from Grange and Loudoun Acadamies. 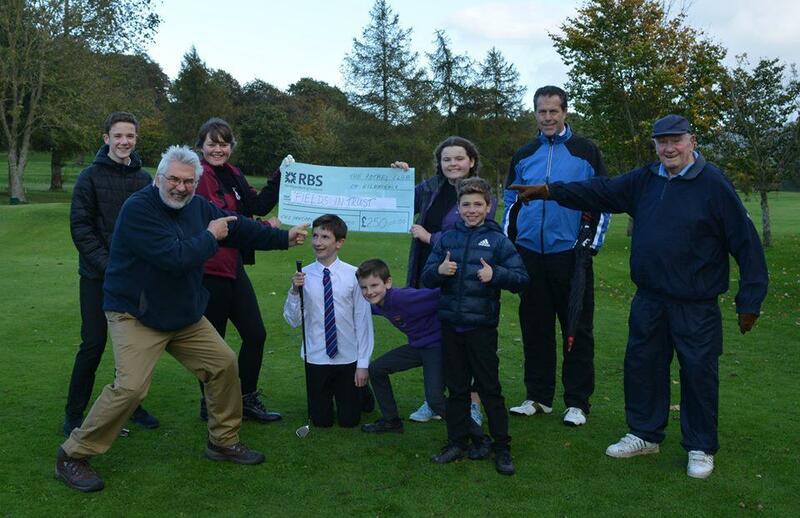 The series has been run successfully for several years and the PGA Professional for this event was Billie Lockie, formerly Professional at Kilmarnock Barassie Golf Club who provided an interesting mix of fun and challenging tasks for the pupils hopefully leading to a long term interest in the game. The improvement in the youngsters over the six weekly courses was impressive. The picture shows the pupils: Sam Johnston, Daniel Johnston, Cameron Cairns, Harry Adams, Caitlyn Bilham, Rebecca Newland with Ian Geddes, President of the Rotary Club of Kilmarnock (left) presenting the Club’s cheque for £250 to David Reynolds, Director of Fields in Trust. Great fun had by all and hopefully some stars of the future.